Calculating ranges is easy. But have you ever tried to calculate a range based on the number in a specific cell? In this lesson, I’ll show you a formula where you make such a reference. 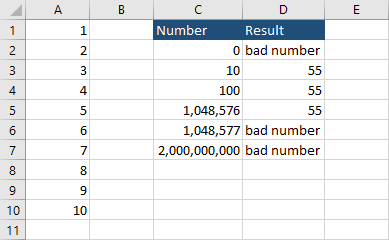 Enter numbers from 1 to 10 into the first column. In cell C1 enter the phrase – Number. In cell D1 enter the phrase – Result. Enter the number between 1 and 1048576 into cell C2. Insert the following code into cell B2. I told you to enter the value between 1 and 1048576 because these are the first and the last row in Excel. If you enter a different value, text, or leave a blank cell, it will return the #REF! error. You can handle this exception by modifying the formula. Now, if you enter the number outside this range the exception will be handled.